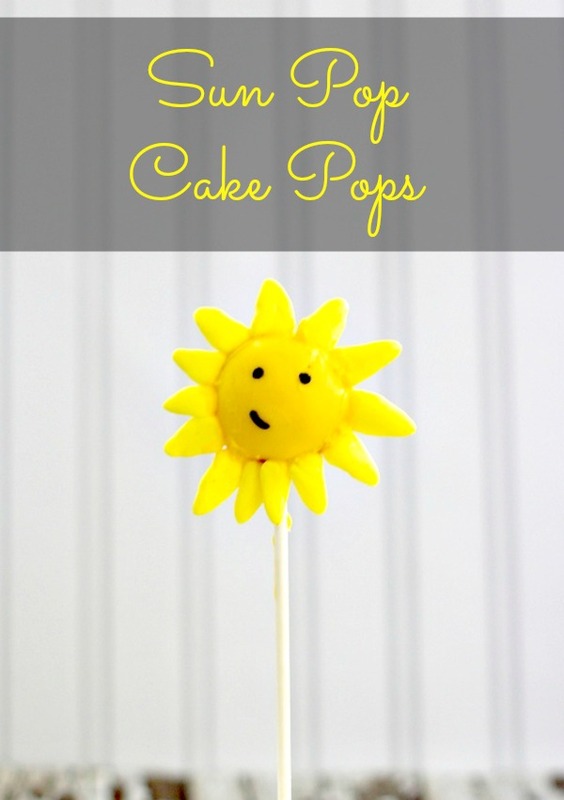 If you’re looking for fun, edible DIY projects during the summer break, here is a easy delicious cake pop idea… Sun pops! The kids will have fun helping you make them and they are awfully darn cute. 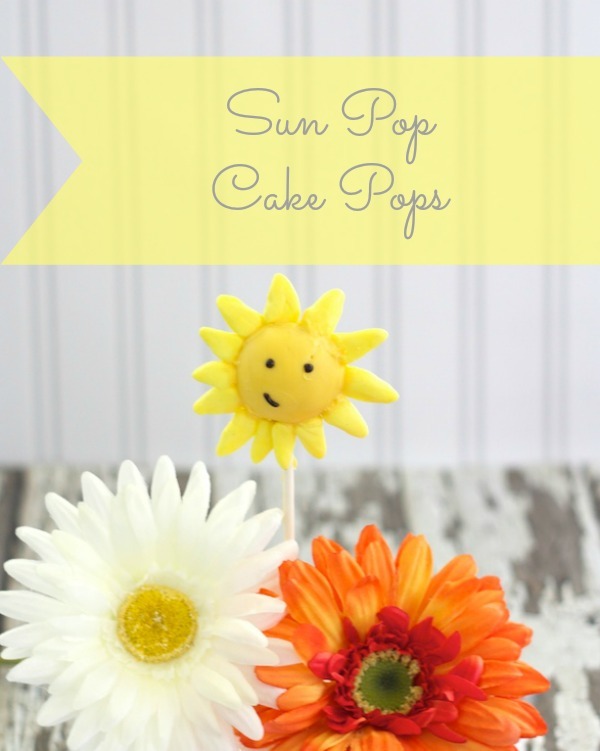 And what a great way to celebrate a sunny summer than with sun pop cake pops?! Melt candy melts in a microwave safe bowl in 20-second bursts, stirring in between each burst on completely melted. Dip one end of each stick into melted chocolate and insert it into the cake pop and allow to harden. Dip each pop into melted chocolate and place in the refrigerator to set up. While cake pops are hardening, take a piece of banana Laffy Taffy and form into small triangular pieces. *For each piece of taffy, I was able to get about 10-12 small triangles from each. After cake pops have hardened, dip the taffy pieces into the melted chocolate and arrange them along the edge of each pop. Allow to set for 15 minutes to harden. After all of the chocolate has hardened, using the black gel frosting, draw on eyes and mouth. Cake pops are such an easy and fun way to involve kids and no matter what your age… everyone loves eating cake pops! 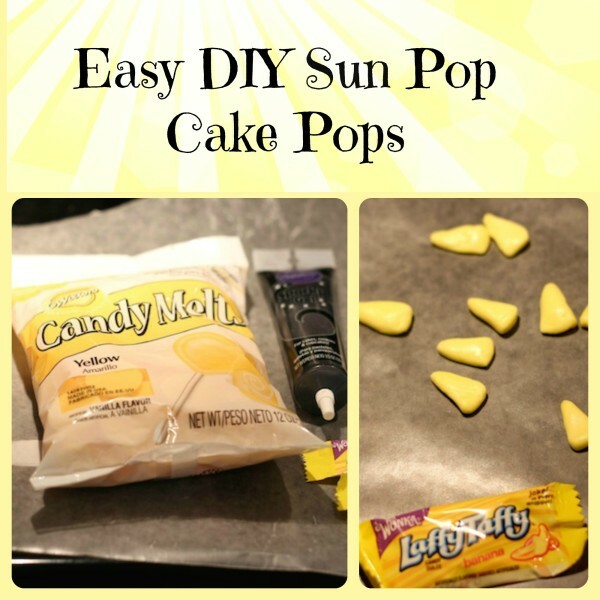 Now that you know how to make cake pop sun pops, you may be asked to make them a lot. Just saying. Do you like to make cake pops? I’m not good at making cake pops, but your version is so cute! That is super cute!! I want to try this! Very cute! To be honest, I’ve never made cake pops. Simple is best when it comes to cooking and baking for ten! Hmmmmm, I think candy corn would work. You could slice through a candy corn to make it thinner (so one candy corn would be 2 pieces) and that would definitely work. Cake pops are so much fun and I just love making them with my kids. We’re not all that creative and our cake pops are just regular. These look super easy to do, and I think I can try to make them. Those are so cute and easy, I love it! My kids would love these. They turned out so cute! Those are cute! I’ve had a heck of a time making cake pops. So cute! I love that you gave the sun a little smile vs a full-on smile 🙂 I’ve never made cake pop – shocker, right? How a adorable a little sunshine in your day. 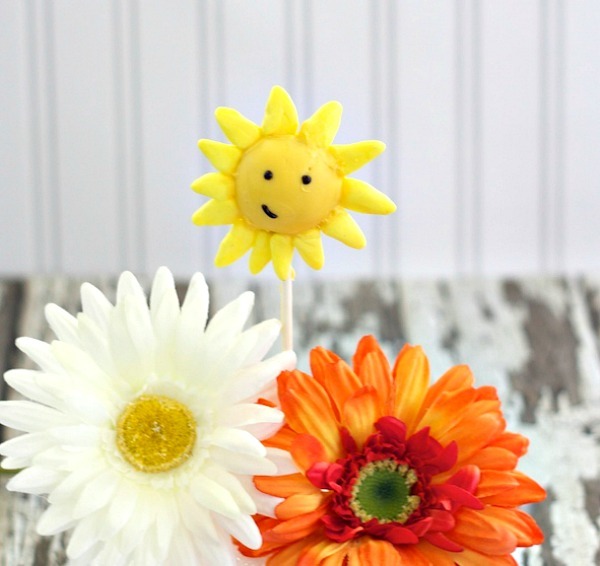 These cake pop sun pops are adorable. They’re sure to brighten anyone’s day! Thanks! I agree, they would make a great homemade treat/gift as a get well gift, or just to brighten someone’s day! These are so super cute and look easy enough for even me to accomplish! I really like that you could use any variety of cake. These are so adorable, and totally perfect for summer. So easy to make too! Those are absolutely adorable! I wish I had seen them before I had made end of the year gifts for my kids’ teachers. Those would be perfect. I’ll save this for next year! Very cute idea, would love making these. How adorable! I have never made cake pops before, but have definitely been wanting to try. I bet my daughter would enjoy making these with me! 🙂 Thanks for sharing! These are so cute and look so good. Thanks for sharing. These look like fun! I’m sure you could use other Taffy flavors to create different Cake pop flowers as well.